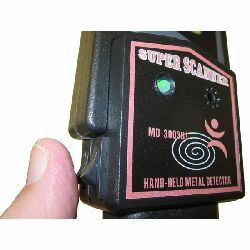 This amazing value security metal detector wand incorporates features such as audio and/or vibro feedback, on/off and separate sensitivity switch, etc, normally only found on high price top of range units. 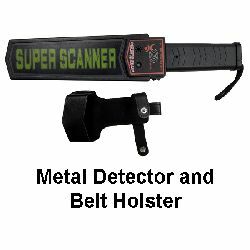 Simple to use, this low cost security metal detector wand delivers an amazing level of performance and comes complete with belt holster. 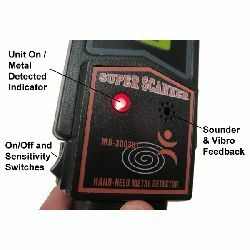 This highly sensitive detector will register even tiny objects such as a paperclip, while the sensitivity level can easily be adjusted to meet your specific requirements. 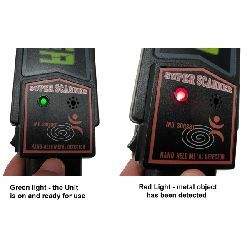 In use, the sensitivity level can be temporarily reduced by pressing the sensitivity button, while for a more permanent adjustment, simply turn the sensitivity adjustment screw to increase or reduce the sensitivity level. 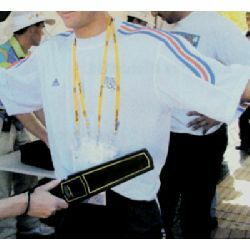 The unit operates from a standard 9V (PP3) type battery which is housed in the handle. It`s a favourite with nightclubs, event organisers, football clubs, galleries and public buildings, etc. How can you select the persons to search without being accused of prejudice? Where it is not practical to scan every person passing through a control point, those individuals that are selected to be searched may feel victimised.